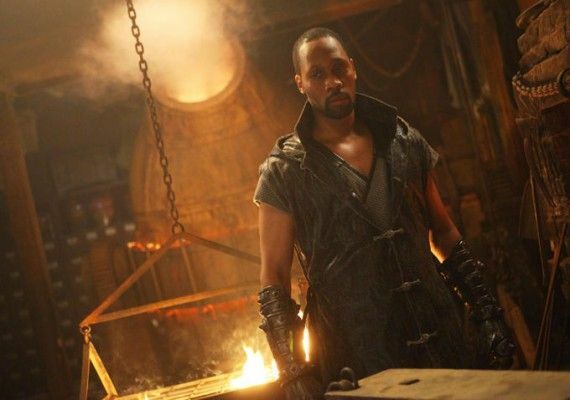 Wu-Tang Clan founder RZA's upcoming directorial debut, The Man with the Iron Fists, appears to be heavily inspired by the films of Quentin Tarantino. It's stylish, violent, and filled with an eclectic cast of heroes and villains, a few of which are played by some notable actors. To that point, we have a large collection of images from the film that help introduce the various friends and enemies that RZA's character, The Blacksmith (a.k.a. the man with the iron fists), will encounter. Included within the gallery are closer looks at Russell Crowe's Jackknife, Lucy Liu's Madame Blossom, and Rick Yune's Zen Yi, just to name a few. The film itself, based on these images, appears to revel in a vibrant color palette - namely a lot of reds and yellows. For a first time director like RZA, it would be easy to get lost in overly bombastic cinematography, but having Quentin Tarantino as your producer and Eli Roth as a co-writer has hopefully pointed RZA in the right direction. Based on the first two appropriately labeled red-band trailers, it's easy to see RZA has picked up a thing or two from Tarantino and Roth. Overly-excessive violence and quirky characters have been part of Tarantino's modus operandi since Reservoir Dogs, and apparently a lot of that influence has rubbed off on RZA. If there's one film that could be labeled as having a heavy influence on Man with the Iron Fists it would have to be Kill Bill, which coincidentally also featured Lucy Liu. InMWTIF,RZA plays an unnamed blacksmith who forges unique weapons (like the Yin/Yang sword featured in the gallery) for some unsightly individuals. However, when those same patrons terrorize his village, he must defend his town against his own creations. Needless to say, some pretty flashy kung fu fight sequences ensue, which are accompanied by musical tracks from a few of RZA's colleagues, including Kanye West, The Black Keys, and Wiz Khalifa. RZA apparently went all out for The Man with the Iron Fists, calling up any and all favors from some of his closest friends - including (surprisingly) the aforementioned Crowe. He also sought out the talents of legendary kung fu stunt coordinator Corey Yen to help make the film's action look as believable as possible. Obviously these images don't sell potential audiences on the film's action, but the aforementioned trailers certainly do. The Man with the Iron Firsts will be out in theaters on November 2, 2012.